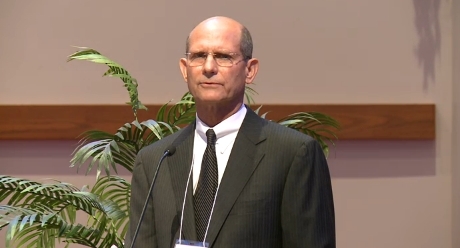 President of the General Conference of the Seventh-day Adventist Church, Pastor Ted Wilson, just finished speaking to the Columbia Union Conference in an effort to maintain church unity. Pastor Wilson's plea was heartfelt and humble. He rightly represented God and His church. We are very thankful for a godly leader who will stand in defense of the truth. The rebellion is so far removed from the truth of church structure and Scripture that none need doubt the wrongness of the position which they have taken. It is very sad, but the rebellion, as in the case of Korah, Dathan, and Abiram is gaining adherents in their effort to reject church authority and Bible truth. These men and women believe that the numbers of princes supporting the rebellion will win the day. But, they fail to understand, as did Korah, that they are not fighting against mere man, but against God. The line was drawn in the sand and they have chosen to stand against God. Let us pray for the other unions that are set to vote and reveal where their loyalties stand. Columbia Union Constituency Approved the ordination of women. In a specially called session of the Columbia Union Conference Constituency, delegates from all eight conferences voted overwhelmingly to approve a recommendation from the union executive committee authorizing ordination without regard to gender. The historic vote was 209 in favor and 51 opposed, with nine abstentions. I am so sorry they would not listen to Elder Wilson. How disrespectful and rude. The rebellion claims to be led by God's Spirit, but it cannot be since they walk contrary to His Word. It is with great joy that we present a revelation of the Spirit of God as seen in the president of the General Conference as he humbles himself before the rebellion pleading for a halt to the rebellion. His remarks begin at 39:16 if you wish to bypass the rebellion. It was very sad to listen to Pastor Daniel Jackson as he encouraged the union to consider the leading of the Spirit. One would consider that good counsel, but in this case it was the wrong counsel. As a member of the General Conference, one of thirteen division presidents that unanimously appealed to the unions in rebellion to cease, he did not repeat that appeal in harmony with the appeal of President Wilson. No, he had no intention to do so. He made no public remarks that we have seen after agreeing with the General Conference in the appeal. There is a spirit in the rebellion, it is not the Spirit of God. So, therefore, for Daniel Jackson to encourage the rebellious union to continue to seek after the leading of the spirit, was to direct the members of the Columbia Union to continue seeking after the wrong spirit. That was before the union voted to separate from the World Church. After the Columbia Union voted and refused the appeal made by the GC, which included Daniel Jackson, the NAD president stood before the rebellious group and sad nothing. There was no reproof. While this was a vote against the Scriptural doctrine of headship, it was more than that. It was a refusal to follow the North American Division and Columbia Union Constitution and by-laws and an the action was directly contrary to the Word Church's explicit vote in General Conference Session in 1990 and 1995, and the General Conference Executive Committee's appeal to the unions to not approve the ordination of women. It is open rebellion. Daniel Jackson, by his actions in leading the North American Division against the world church needs to be removed from his position as a General Conference officer.